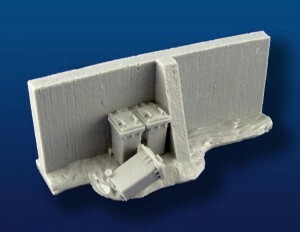 Acheson Creations has a new terrain piece available, the braced concrete wall. Acheson Creations announces the arrival of the next 28mm Science Fiction product – Braced Concrete Straight Wall Section w/ Bins, priced at $2.00USD (unpainted only at this time). This piece is 10cm (4 inches) long, 4cm (1 5/8 inches) high and is modeled in 28mm (1:56 scale).